The ever-growing threat of ransomware and other malicious malware-based attacks has proven that client protection solutions cannot be measured based only on endpoint compliance. Traditional antivirus technology uses a long-embattled signature-based approach, which has failed to match the pace of emerging malware and evasion techniques. Those demand a different approach to client protection. Furthermore, with the proliferation of telecommuting, mobility and BYOD, there is a dire need to deliver consistent protection for endpoints anywhere. 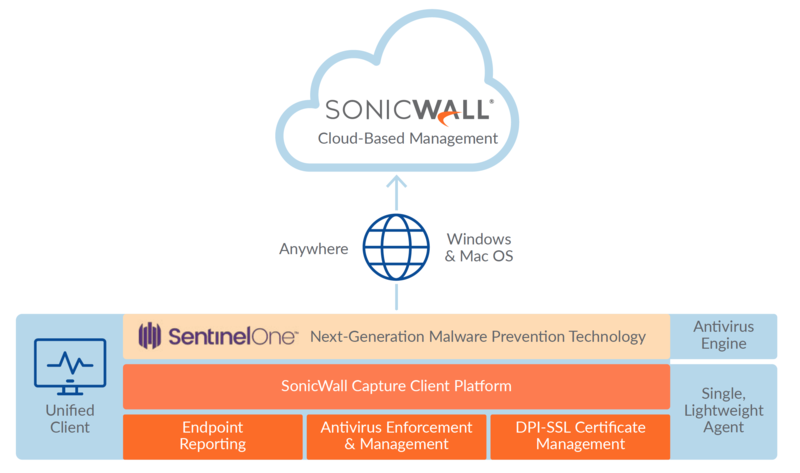 SonicWall Capture Client is a unified endpoint offering with multiple protection capabilities. With a next-generation malware protection engine powered by SentinelOne, Capture Client applies advanced threat protection techniques, such as machine learning and system rollback. Capture Client also leverages the deep inspection of encrypted TLS traffic (DPI-SSL) on SonicWall firewalls by installing and managing trusted TLS certificates. Capture Client co-exists with the SonicWall Content Filtering Client and the SonicWall Global VPN Client. Policies for all products can be managed from a single cloud-based management console. Capture Client can be easily added to any client deployed either through Microsoft Active Directory group policies or any other third-party software deployment techniques; or through the delivery of customized URLs where clients can download and silently self-install without any additional intervention. And, when integrated with SonicWall firewalls, Capture Client delivers a zero-touch silent experience for deployment on unprotected clients. The SonicWall cloud-based management console functions as a single pane of glass to manage all client policies, including next-generation malware protection, DPI-SSL certificate management, content filtering and VPN. The management console is a multi-tenant cloud-based platform offered at no additional cost. It provides client protection reporting and policy management, with support for fine-grain access control policies. These allow managed service providers (MSPs) to manage and report on clients of multiple customers. At the same time, each of those customers can only manage and report on their own clients. It also functions as an investigative platform to help identify the root cause of detected malware threats and provide actionable intelligence about how to prevent these from recurring. For example, an administrator can easily view what applications are running on a client. That, in turn, can help identify machines that may be running vulnerable or unauthorized software. The SonicWall Capture Client is available in two offerings: SonicWall Capture Client Basicdelivers all SonicWall next-generation malware protection and remediation features, along with DPI-SSL support capabilities. 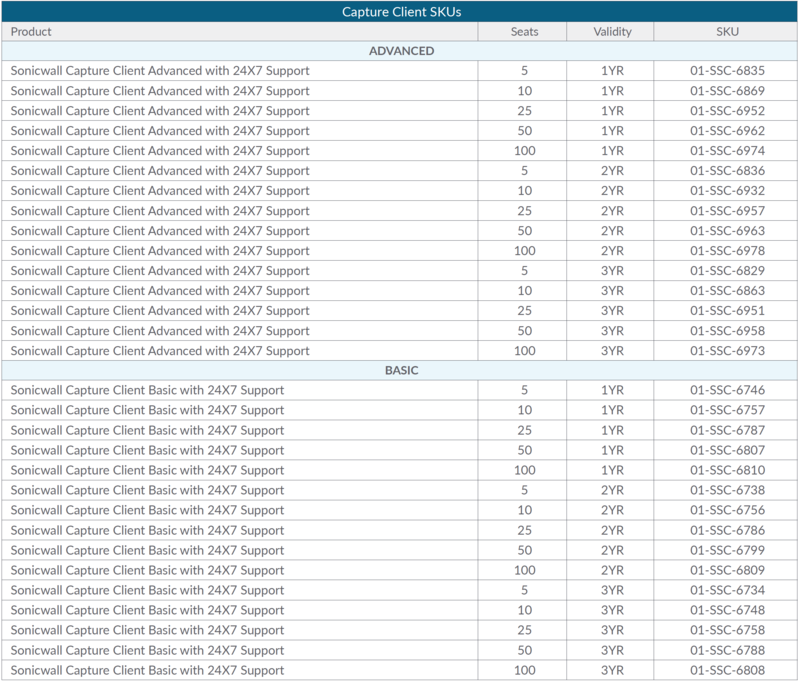 SonicWall Capture Client Advanceddelivers everything listed above for Basic, plus advanced rollback capabilities. Both offerings are available for Windows 7 and higher, as well as for Mac OSX. Multiple layered, heuristic-basedtechniques for protection include cloud intelligence, advanced static analysis and dynamic behavioral protection. These helps protect against and remediate known and unknown malware. No need for regular scans or periodicupdates enables the highest level of protection at all times without hampering user productivity. Unique rollback capabilities also support policies that not only remove the threat completely but also restore a targeted client to the state before the malware activity initiated. This eliminates the need for manual restoration in the case of ransomware and similar attacks. Cloud-based management consolereduces the footprint and overhead of management. It also improves the ability to deploy and enforce endpoint protection, wherever the endpoint is. Integration with the SonicWallnext-generation firewalls delivers zero-touch deployment and enhanced endpoint compliance. Plus it enables enforcement of deep packet inspection of encrypted traffic (DPI-SSL) by deploying trusted certificates to each endpoint. SonicWall has been fighting the cyber-criminal industry for over 25 years, defending small, medium size businesses and enterprises worldwide. Our combination of products and partners has enabled a real-time cyber defense solution tuned to the specific needs of the more than 500,000 businesses in over 150 countries, so you can do more business with less fear.